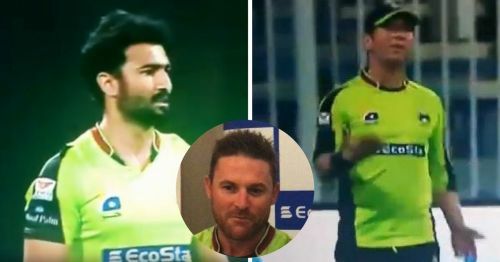 The third edition of the Pakistan Super League witnessed a bizarre incident in the league match between Lahore Qalandars and Quetta Gladiators as two players from the same team (Qalandars) were involved in an on-field spat. Their skipper, Brendon McCullum, had to intervene and play the role of a peacemaker to calm things down. After setting a target of 187, thanks to a destructive 50-ball 94 from Pakistan opener Fakhar Zaman, the Qalandars bowlers kept the Gladiators at bay by striking at regular intervals. With the chasing team needing 30 runs off nine balls to win, the bowler Sohail Khan wanted a change in fielding position for the deep square-leg fielder, Yasir Shah. Both, Sohail and wicketkeeper, Gulraiz Sadaf, tried to get the attention of the leg-spinner, who was not aware of what's going on around him. Sohail Khan threw the ball at Yasir in anger and got a prompt response from the leggie. Though the ball didn't hit him, Yasir became furious and had a verbal exchange with the fast bowler before he threw the ball back at the bowler. With the situation threatening to go out of control, Lahore captain McCullum intervened and made sure that the normalcy was restored in the match. Sohail finished his over and eventually, Lahore beat former Champions Quetta Gladiators by 17 runs, thanks to a brace of wickets, each by Sunil Narine and Yasir Shah. After the match, both Sohail Khan and Yasir Shah refused to shake each other's hands. Former England batsman Kevin Pietersen, who is a part of the Quetta Gladiators, described this incident as the funniest moment in his cricket career as he tweeted out, "I think I witnessed the funniest moment of my cricket career tonight, when the bowler couldn’t get the attention of his boundary rider & threw the ball at him on the boundary... UNBELIEVABLY HILARIOUS!". In spite of this win, Lahore couldn't move out of the last position as they lost their first six matches and won their next three after confirming their elimination from the tournament.